The VWR Magnetic Lab Stirrers come equipped with magnetic belt driven motor and operate on standard 115V power. The Ceramic tops are easy to clean and the 7x7 platform allow for larger capacity stirring. These simple and easy to use lab stirrers come with analog controls which control the speed in which the belt rotates. 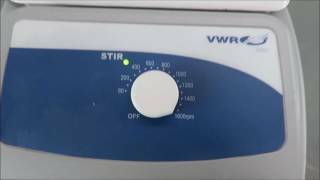 Contact us for questions about our VWR Magnetic Lab Stirrer. Top Dimensions 7 x 7 "
This listing is for a slightly used VWR Magnetic Lab Stirrer. Unit has been tested and is ready to ship, contact us with questions.